Well its my last post as this month's Guest at Crazy 4 Challenges, I had such a great time stamping with those fabulous ladies this month!!!!! For the final challenge of October, Jessie's challenge is CHRISTMAS cards. For my card I used Tree Dress Avery by Paper Nest Dolls (available here as a digi, or the stamp here). I paper pieced her dress and added some green rhinestone "ornaments". I think I have finally found a Gold Glitter pen that is AMAZING!!!! For the Star I used a Gold Wink of Stella... and it is FAB!!!!!!!!!!!!!!!! Perfect shimmer, but still shows the lines of the stamp. Well that's it for me for now, hope you'll play along!!!! C4C: Fall is in the air! Hey yall! I am having such a great time guesting this month for Crazy 4 Challenges... those ladies are stinking brilliant!!!! Anyway, today's challenge is a color challenge, think FALL LEAVES, so rust, hunter green & yellow!! For today's card I used a couple of brand new goodies from CAS-ual Friday's stamps, Autumn Blessings stamp set and Acorn Fri-dies. I also used this week's CAS(e) this Sketch! The sentiment is embossed in black, for the rest of the line-art images I played around with several different Distress Inks. For a couple of the yellow leaves, I stamped some of the ink off on a scratch paper just so it was a bit lighter. The solid orange die cut leaf, I used the Orange Ombre ink pad... I soooooooo LOVE those pads!! Just cause I needed a little more texture, I added a twine bow. Voila! Simple, quick and lots of fun! Crazy 4 Challenges.... sketch fun! Hey yall! Back for another Crazy 4 Challenges!!! This week is a sketch challenge, who doesn't love sketches? and this one is FABULOUS!!!! (see below) I turned the sketch on it's side and grabbed some Reverse Confetti goodies to make a super quick card! Be sure to head on over to the Crazy 4 Challenges blog to see what the amazing DT came up with and then link up your creation!!!! Happy stamping! Crazy 4 Challenges... Costume Fun! Hey yall! I'm back for another fun Saturday of being a Guest Crazy!!! This week's challenge is COSTUMES! Dig out those stamps, dies or anything else you've got showing off a costume! Hmmm, I'm thinking even a Santa image would work for those of you getting a head start on Christmas cards ;) This image is from the Hey There Punkin set at Kraftin Kimmie! And cute lil' Lucas is ready for some Trick or Treats!! The bats are from the Silhouette Online store, love these!! Ok, that's it for my quick post. Be sure to pop on over to the Crazy 4 Challenges blog to see the amazing goodies their DT has for you and don't forget to link up your creation!!! Crazy 4 Challenges... I'm a GUEST Crazy!!! How excited am I?!?! I get to be this month's Guest over at Crazy4Challenges!! This week's challenge is HALLOWEEN TREATS... so whip up something that holds a Halloween Goodie or has one on it! I made a couple of different treat bags, cause ya know, I play favorites ;) These bigger bags will hold some homemade goodies as well as chocolate (yup, these are for my faves)... shhhhhh! That big ol' tag is a die from Reverse Confetti, Tag Me Too. The sentiment on the tag is from the Spook-tacular Sentiments set from Kraftin Kimmie, and that fraidy cat is a button I grabbed from the Kraftin Kimmie store. I picked up a package of those Chevron bags in assorted colors from Hobby Lobby. I'm so excited to be stamping along with the amazing stampers over at C4C this month!!!! be sure to pop on over to Crazy Blog to see what their amazing DT came up with! and then to link up YOUR creation! Hey yall!! Another month and means it's time for another CAS-ual Chic challenge!!! This month it's all about variety!! Chose a row, any row then get busy!! For my card I chose the column on the far right... STENCILING, DIE CUTTING & EMBOSSING! I used the last week's Crazy 4 Challenges, Show Me the Blue color palette for inspiration here. First off, I used the CASUAL ELEGANCE stamp set and coordinating CASUAL VINE Fri-die. I used Tim Holtz's Burlap stencil for my tag. I started off with some Kraft cs, then using Storm Sky and Frayed Burlap Distress inks, I sponged over the stencil. I stamped the solid vine image from the set with some Sicilian Blue Fresh Ink, then embossed with clear EP. Then I used the die to cut them out. I also used the line-art vine on the card base, stamping it in Brown Ombre ink. The embossed and die-cut vines are adhered with pop-dots. I love all of the movement and textures with this one! Ok, now it's your turn... grab 3 in a row and get out some CFS stamps and have some fun!! 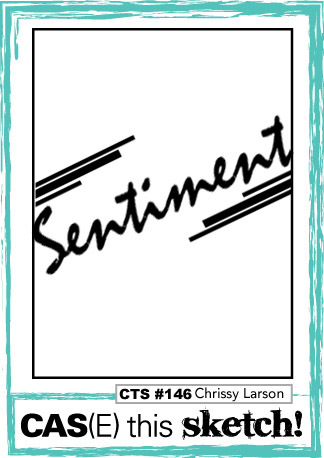 Swing by the CAS-UAL CHIC blog for more DT inspiration and to link up your creation! We can't wait to see what you come up with!! !